Duplicate Voter ID Card - Here is How to Apply for it? I lost my voter id card in travelling, how can find my voter id card. forget my voter id card so please give me new voter id card,thanku. I am from Assam and presently staying in Bengaluru. I lost my Voter ID Card so I want to apply for a duplicate one but I have some doubts, kindly find the below points and let me know the same. 1. Where do I need to submit the documents and all? Can I submit the same in any nearest office in Bengaluru or I have to submit it in Assam only? 2. Is there any charges? 3. Since I lost the card in Bengaluru only so where do I need to file an FIR in Bengaluru or in Assam? 4. There is spelling mistake on the Card, like my surname is ROY but it is written as RAY so can update the same while applying for the duplicate one??? I apply form 08 by online on date 27/12/2015,Its reference no. is 01450faae6dbc832a, My surname spelling (only in English) is wrong on my Voter Card (EPIC). I did not loose my Voter ID Card but originally Spelling mistake was there in my own as well as my elder son’s Voter ID Card for which I had applied officially in the Election Office of Jorhat,Assam but yet to get the correct one however, I am holding the previously provided wrong one and same is the case for my son. I lost my election card but I do not know the voter id number to apply for a duplicate. Can anyone tell me how I can find the id number or if we can apply for a duplicate card without the original id card number. I have not yet received my voter card. IT’S MOHD KHALID FROM HARYANA MEWAT NUH . I HAVE MY VOTER CARD BUT THE PROBLEM IS THAT THE PHOTO ON CARD IS UNABLE TO IDENTIFY BY NO ONE , BECAUSE OF ITS DARKNESS ,SO IT IS NOT USED FOR ANY WHERE..SO I WANT TO MAKE A NEW VOTER CARD ,,, SO WHICH FORM NO. I HAVE TO FILL ONLINE, CAN YOU MAIL ME THIS. You will have to fill the Form 8 for correcting your photograph. You can fill it offline by downloading Form 8 and submitting it to your nearest Electoral office or fill and submit online. Below are the links to both, you can choose whichever you want. Also you will have to choose the option of the details to be corrected as photograph in part IV of the offline form or Part V of the online form. Do note that since you name is already in the Voter List, you are eligible to vote and can carry any other ID proof like PAN card, driving license, Aadhaar Card, Passport etc to cast your vote. Thanks for the post! I have lost my voter Id. I have filled Form 002 + I have FIR copy now + ID proof also. Please tell me how can I submit this online? I mean what subject and do I have to send it as attachments all the documents? Please guide me..thanks in advance. In case you have already filled the form and everything else is ready, I would suggest you visit the Local Electoral Registration office of your area and submit the form physically and take the receipt. Pls guide me with my situation. I have lost my voter id and unfortunately do not hold any copy of the original document or the details pertaining to it. Can I apply for a duplicate id, if yes then what’s the procedure, if not what should I be doing on this regard, should I be applying for a new id or anything else. Do Kindly help me on this. If you have your Voter ID Card number with you then you can file an FIR and then apply for a duplicate Voter ID Card. However if you don’t have the number too, then you can try to check the number at this link here. You will have to fill in the required details in order to know your EPIC number. If that too fails, then as a last resort you will have to apply for a new voter ID card. Please mera Id card kho gaya hai. Mujhe duplicate if card ki zaroorat hai. Please help me. mere pas koi bhi photocopy nahi h voter card ki…..
I’m from Odisha and I have downloaded the lost voter ID card form from the website. I filled it and I have a copy of FIR with me.. Where should I submit this form.? Please give me some instruction that how can i take a duplicate Election Card by On line . Because I lost my Election Card . I hope you take decision at earliest. if i could not have FIR…. i lost my voter ID and i dont have ID number. what should i do to get new one…..
i have lost my voter id card on journey. I have made a complaint in local police station. I have a copy of my id card with me. How can i get a duplicate id card. If any one forund the card please return back. 1)How to get my card…? 2)Can I apply for duplicate Voter ID card using the Card number I came to know today…?3)Can I get my address corrected in duplicate card…? sir pls arrenge my voter id card, my voter id card is lost. pls courier thru my votr id card at my home. ADD ; 107/8 ULTADANGA MAIN ROAD, L.I.G BUILDING BLOCK-6 FLAT-33 KOLKATA 700067.
i have pan card,adhar card,but no birth certificate or school certificate.my epic card lost.how i can get my duplicate epic card. KANERI, BHIWANDI, THANE MAHARASTRA 421302.
i want to new voter id card ,,but which ? plz, support me. I am vivek kumar singh. I have epic slip, and already register for epic 8 months ago. but i have not found my voter id card. I Have Voter ID Card But Photo Not Clear. Please Send My Duplicate voter id card…. Sir I have lost my voter i card . and i want to know how to get card no . my name is nitin. from bijnor up. HOW TO DELETE MY DUPLICATE VOTER ID CARD? This is Srikanth from Hyderabad, A.P. Everytime when elections happen i will get voter slip but i didn’t get my voter id till now, my age is 31, i have all the details like EPIC No, , Port No, Serial No., Assembly number., Can you please tell me how to get the Voter ID Card. I lost or it could be misplace. Now i want dublicate voter id card,How can i apply online to get dublicate voter id card?? my voter id lost in few days .i am apply one time in voter polling..but my voter id is not generate…plz.my voter id launch. How to apply another id. address village and post raison,Tahsil- sandila, Hardoi. sir, my election id cad has been lost! Now i want to get a new voter id card. How can i apply 4 it, online. Sir plz rply me must, i m out of station now! Becouse i m in central paramilitory force! I want to change the address in my voter id card. pls give me the information. I have lost my voting card. I have to create duplicate voter card. So Can I get Contact details for Nagpur central and Nagpur east ? I am trying to search it on google. But I am not getting . give me my duplicate voter card…. i want my duplicate voter id card. plz sir issu my duplicate voter id card. my V.id – NO. is -BDC5612882. i want to dublicate votre i d card. What s u r state? i have the enroll number of my voter id..how can i download the voter id through net.what is the link to download..pls tel me..
my card is not damaged or lost. it is the commissions mistake that they dint stick the orignal hologram on it. belongs to bangalore, karnataka. I’ve applied for the Voter card long back but not yet arrived and my Voter Id no is this 23411878. please look into this and help us out. maine voter id banwaya tha magar wo mujhe abhi tak mila nahi lagbhag 2 years ho geya. photo bhi kich geya tha . I want to know my voter ID number. I want 2 know my id number. 1) you pleas go to download voter list of your concerned area and locality from the same site. If your name is there in the list, you can find out your voter id from that list. 2) If you know the voter id of any of your family member, pls insert that No in search name in the list by voter id. Name of that perticular person will appear. There you shall find “family” option there. just click it. hope you’ll find your name in the list with your voter id. NAME-SINTU KUMAR YADAV.FATHER-NARESH YADAV.ADDRESS-SOHJANA,JHAJHA PIN-811308.POST-JHAJHA.THANA-JHAJHA .DISTT-JAMUI.HOW TO APPLY FOR A NEW VOTER CARD. My voter Id number is FYY0740845 and lost my id. Can you please help to share the voter id is still valid or not , so that I can apply for new one if its not valid. Also share the duplocate id through mail if possible. MY EPIC NO is HR /07/850522620 , Since initial issue date I couldn;t receive it . I could only got this my EPIC No. when school teacher asked my Aadhar No. to link with this. Please check the Status of you application over here: Check Voter ID Card Status to know what is the problem with the voter Id card. Then please follow the steps mentioned in the post above to proceed with the duplicate card application. You will have to submit the application yourself, no one else can do it for you. I want a duplicate voter card. urgently need on line , how to get it. Please reply. 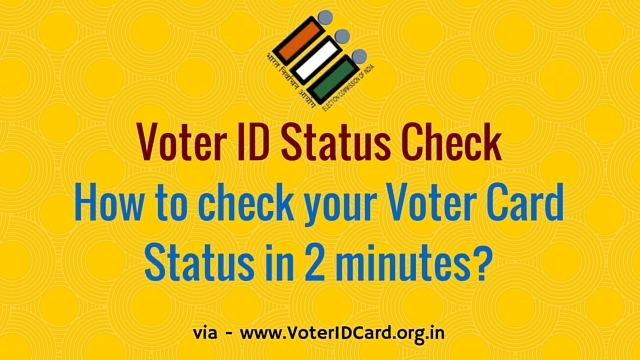 You can follow the steps mentioned in this post to get a voter id card for your self. I lost my voter id card,so Irequested please provide me my voter id card.